LONDON - The Independent posted the biggest year-on-year increase of any newspaper website last month, although all fell month on month during the quieter holiday period with the exception of The Sun. The Independent's unique user base surged by 166% year on year in December to 8.8 million. The next best year-on-year growth came from Telegraph online, which doubled its users year on year (up 100%) to post 21 million unique users in December. The Independent's growth will boost owner Independent News & Media UK, which saw the print version of The Independent shed more than 10% of its circulation year on year in December. 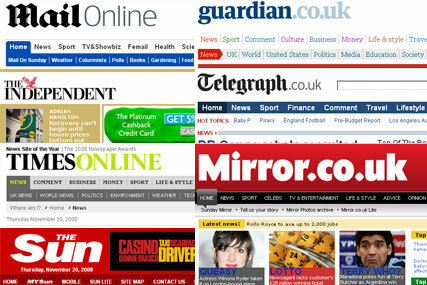 Overall, Guardian.co.uk retained its status as the most-visited UK newspaper website in December. Although – like all newspaper websites during the seasonally quieter period for online traffic – its unique user base fell sharply from November, from 26 million to 22.8 million, it remained the most-visited site. Close behind Guardian.co.uk in second place was Telegraph online with 21 million unique users, followed by Mail Online with 19.7 million unique users in December. The Sun Online continues to close the gap between itself and the leading quality newspaper websites. Its unique user base grew by 81% year on year to 19 million in December. Mirror Group Digital, meanwhile, posted 5.3 million unique users in December. Its year-on-year comparison was not available, although in a statement the outfit said year on year the site's UK audience increased by 70%.